The aim of this study was to evaluate the prognostic significance and to define the optimal cutoff points of nodal ratio and number of dissected nodes in node-positive and node-negative breast cancer patients, respectively, who underwent inadequate axillary lymph node dissection (ALND). The absolute number of involved axillary lymph nodes (LNs) is considered the most important prognostic factor in breast cancer. Over the last decade, several studies indicated that the lymph node ratio (LNR) might predict outcome better than the number of positive LNs. This retrospective study included 200 women with invasive breast cancer. Group I included node-positive cases with inadequate ALND; group II included node-positive cases with adequate ALND; group III included node-negative cases with inadequate ALND; and group IV included node-negative cases with adequate ALND. Receiver operating characteristic curve was used to identify cutoff points of LNR in each of the node-positive groups, and number of dissected nodes in node-negative patients, classifying the patients into low-risk and high-risk groups. Optimal LNR cutoff points classifying node-positive patients into low-risk and high-risk groups were 0.44 for group I and 0.40 for group II with statistically significant differences in disease-free and overall survival. There were no statistically significant survival differences between groups III and IV. The cutoff point of six dissected nodes classified the node-negative patients into low-risk and high-risk groups with statistically significant differences in disease-free and overall survival. LNR could be incorporated into the staging of breast cancer patients, especially those with inadequate axillary dissection. LNR cutoff points of 0.44 and 0.40 can be used to classify node-positive patients with inadequate and adequate axillary dissection, respectively, into low-risk and high-risk groups. For node-negative patients, oncologists can be satisfied with a number of dissected nodes as low as seven axillary LNs. Breast cancer ranks as the first malignancy affecting women, accounting for 29% of cancer in the female population. Breast cancer is second only to lung cancer as a cause of cancer-related death in women . Metastasis to the axillary lymph nodes (LNs) is a key indicator of prognosis in breast cancer . The AJCC TNM staging system for breast cancer emphasized the importance of the absolute number of positive nodes in the N classification for staging breast cancer: pN1 disease indicates 1–3 positive axillary nodes, pN2 denotes 4–9 positive nodes, and pN3 is defined as 10 or more positive nodes . The potential issue of using the absolute number of affected nodes for staging is the dependence upon the overall number of nodes examined. In other words, three positive nodes out of a total of five examined have a different implication compared with three positive nodes out of 10 examined . Although some studies noted that six nodes were the minimum number of nodes needed to adequately assess the axilla , it is generally accepted that greater than 10 LNs are required . When 10 or less nodes are removed, there is a greater probability that some patients with four or more positive nodes will be misclassified as having 1–3 positive nodes. In other words, patients are potentially understaged . An increasing dilemma for clinicians is whether to give patients with 1–3 N+ postmastectomy radiation therapy, particularly if a patient had undergone inadequate axillary dissection. When lesser than or equal to 10 nodes are removed, there is a greater probability that some patients with four or more positive nodes will be misclassified as having 1–3 positive nodes . In these cases with few nodes removed, patients cannot be classified as having pN3 disease, which can affect comparisons between institutions in which the practices of axillary dissection differ. To improve the prognostication system, one would intuitively take not only the number of positive LNs but also the number of nodes examined into account . 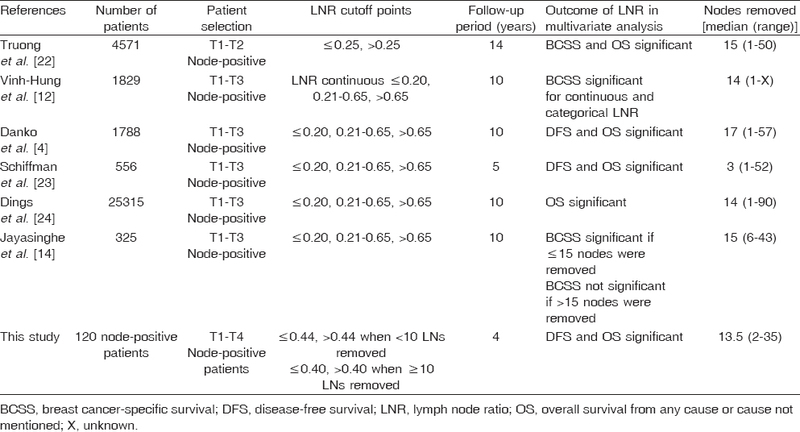 Several studies have examined the concept of the lymph node ratio (LNR), defined as the number of positive LNs over the number of LNs removed, as a potential prognostic factor in breast cancer and suggested that it may be an alternative and possibly a better indicator of axillary tumor burden and consequently disease prognosis compared with pN staging ,,,,. Vinh-Hung et al. defined optimal cutoff points for LNRs and divided the population into those at low-risk (≤0.20), moderate risk (>0.2 and ≤0.65), and high-risk (>0.65). The LNR groups had significantly different survival rates and were more accurate compared with pN status for predicting survival. Many studies have reported a strong association between the extent of axillary dissection and the number of positive nodes and an association with survival, both in node-negative and node-positive patients . Conversely, one study described worse outcomes with the removal of more LNs . A retrospective study of 833 node-negative breast cancer patients who underwent mastectomy and 1094 node-negative patients who underwent breast-conservation therapy showed that the recovery of less than 10 LNs in LN-negative patients who underwent mastectomy resulted in a 10–15% decreased long-term disease-free survival (DFS) rate compared with patients who had a more extensive axillary assessment. However, the number of LNs examined did not have an impact on the DFS rate in a contemporary cohort of patients who underwent breast-conservation therapy, which included radiation . Encouraged by these results and the fact that inadequate axillary dissection (i.e., excision of 1–9 axillary LNs) is a frequently encountered situation in our daily practice, we conducted this study aiming to evaluate the prognostic significance and to define the optimal cutoff points of nodal ratio and number of dissected nodes in node-positive and node-negative breast cancer patients, respectively, who underwent inadequate axillary LN dissection. This retrospective study was conducted at the Clinical Oncology Department, Menoufia University, for patients with invasive primary breast cancer who underwent inadequate axillary dissection from January 2009 to December 2013. This study was approved by the Ethical Committee of Faculty of Medicine, Menoufia University. Eighty-eight patient files with inadequate axillary dissection were recognized, 50 of which were for node-positive patients and 38 for node-negative patients. A matched group of 112 patients with adequate axillary dissection was selected: 70 were node-positive and 42 were node-negative. The total number was 200 patients, representing the study population. Female patients with histologically proven primary invasive breast carcinoma who underwent a curative breast cancer surgery including axillary LN dissection, and aged from 18 to 70 years old were included in the study. Exclusion criteria were as follows: metastatic breast cancer at the time of diagnosis, incomplete data from medical records, bilateral breast cancer, or diagnosis synchronous with malignancy other than breast cancer. Patient files were searched for the following information for each patient: patient characteristics, diagnostic methods, histological features of the tumor, including immunohistochemistry, number of dissected and positive LNs, LNR, treatment details, recurrence data, and survival. The endpoints for the survival analyses were DFS and overall survival (OS). Inadequate axillary dissection was defined according to NCCN guidelines 2015 as the total number of axillary LNs excised ranging from one to nine LNs. LNR was defined as the number of positive LNs over the number of LNs removed. Survival functions were estimated by applying the method of Kaplan and Meier. The log-rank test was used to assess the significance of unadjusted differences in survival. Exploration of variables for their independent prognostic effect on survival was carried out using the multivariate stepwise Cox's proportional regression hazard model. Receiver operating characteristic (ROC) curve was used to identify the cutoff points of nodal ratio and number of dissected nodes. A two-tailed P value of less than 0.05 was considered statistically significant. All statistical evaluations were carried out using the computer statistical package (IBM SPSS statistics for Windows, version 22.0; IBM Corp., Armonk, New York, USA). Two hundred patients were considered eligible for the analysis; none of them underwent a sentinel LN procedure. [Table 1] depicts patient, disease, and treatment characteristics. For the entire cohort, the median follow-up period was 47 months, the mean age was 47 years, and 78% of patients were older than 40 at the time of diagnosis. In this series, 56% of patients had pT2 disease, 40% of patients were node-negative, and 31% had a pN1 disease. Invasive duct carcinoma was found in 89.5% of the cases, 87% of cases were of grade II, and 74% of cancers were hormone positive, whereas only 17.5% had Her2 overexpression. Radical surgery was performed in all cases; 77% of the cases underwent modified radical mastectomy. The number of dissected nodes ranged from 1 to 40, and the mean was 14.3. Overall, 85% received chemotherapy, 71.5% received adjuvant radiotherapy (RTH), and 74% received adjuvant hormonal treatment, whereas only 6% received adjuvant trastuzumab. Groups I and II were separately tested for the cutoff points of nodal ratio, according to which the patients can be stratified into high-risk and low-risk groups. For group I, node-positive patients with inadequate axillary dissection (n = 50), the cutoff point of nodal ratio was found to be 0.44 with a sensitivity of 70.6% and a specificity of 78.8%. The mean DFS for low-risk patients (nodal ratio ≤0.44) was 59.6 months, compared with 19.5 months for the high-risk patients (nodal ratio >0.44) with a highly significant P value of less than 0.001. Kaplan–Meier curve for DFS in this group is shown in [Figure 1]. The mean OS for the low-risk group was 72.2 months, compared with 62.1 months for the high-risk group (P = 0.01). OS curve is shown in [Figure 2]. The nodal ratio was found to be an independent adverse prognostic factor for DFS and OS in the multivariate analysis for this group of patients [Table 2] and [Table 3]. Figure 1: Kaplan-Meier curve for disease-free survival in relation to nodal ratio in group I (n = 50). Figure 2: Kaplan–Meier curve for overall survival in relation to nodal ratio in group I (n = 50). For group II, node-positive patients with adequate axillary dissection (n = 70), the nodal ratio cutoff point was found to be 0.40 with a sensitivity of 83.3% and a specificity of 92.3%. The mean DFS for low-risk patients (nodal ratio ≤0.40) was 67.3 months, whereas for high-risk patients (nodal ratio >0.40) it was 19.6 months (P < 0.001). The mean OS for low-risk patients was 98.2 months, compared with 68.7 months for the high-risk patients (P < 0.001). Kaplan–Meier curves for DFS and OS in this group are shown in [Figure 3] and [Figure 4]. The nodal ratio was found to be an independent adverse prognostic factor for DFS [Table 4], but not for OS in the multivariate analysis for this group of patients. Figure 3: Kaplan-Meier curve for disease-free survival in relation to nodal ratio in group II (n = 70). Figure 4: Kaplan–Meier curve for overall survival in relation to nodal ratio in group II (n = 70). There was only a marginal difference in DFS and OS between the two groups, with no statistical significance in either of them. The mean DFS for groups III and IV was 105.7 and 106.7 months, respectively (P = 0.57). The mean OS was 103.6 months for group III and 124.3 months for group IV (P = 0.48). ROC curve was used to identify the optimal cutoff point for the number of dissected nodes among the whole node-negative patients (n = 80). The result was six LNs with a sensitivity of 83.3% and a specificity of 91.9%. The mean DFS for low-risk patients (>6 LNs dissected) was 114.4 months, whereas for high-risk patients (≤6 LNs) it was 45.6 months (P < 0.001). The mean OS was 126.7 and 70.4 months for low-risk and high-risk patients, respectively (P = 0.035). Kaplan–Meier curves for DFS in node-negative patients, according to the cutoff point of six dissected LNs are shown in [Figure 5]. Figure 5: Kaplan-Meier curve for disease-free survival. (DFS) in relation to the number of dissected nodes in node.negative patients (n = 80) (P < 0.001). The multivariate analysis showed the number of dissected nodes, according to this cutoff point, to be an independent prognostic factor for DFS together with the ER status [Table 5]. However, for OS there were no other significant factors other than the number of dissected nodes in the univariate analysis. LNR has been widely demonstrated to be a useful alternative to predict survival in many cancers, including lung , colon , pancreas , bladder , and particularly breast cancer. [Table 6] shows some recent studies published since 2008 and these studies confirmed the superiority of LNR over the number of involved nodes as an adverse prognostic factor for breast cancer. Vinh-Hung et al. , in their study on 1829 node-positive breast cancer patients from the Geneva Cancer Registry, defined the optimal cutoff points for LNRs and divided the population into those at low-risk (≤0.20), moderate risk (>0.2 and ≤0.65), and high-risk (>0.65). The LNR groups had significantly different survival rates and were more accurate compared with pN status for predicting survival . In view of our relatively small sample size, we tried to define a single cutoff point for each of the two node-positive groups to divide patients into low-risk and high-risk groups. This is similar to that reported by Truong et al. , who identified a single nodal ratio cutoff point, estimated 0.25, in their study of 4571 node-positive patients. For group I, the identified nodal ratio cutoff point of 0.44 lies in the range of the intermediate risk group defined by Vinh-Hung et al. (0.21–0.65); our results are consistent with their results. The significance of nodal ratio for this group as an adverse prognostic factor for both DFS and OS is in agreement with the results published by Jayasinghe et al. , who reported that LNR predicts survival more accurately when a lower number of LNs is removed. They studied 332 patients with node-positive breast cancer and found the nodal ratio to be an independent predictor of 10-year breast cancer-specific survival when 5–15 LNs were removed, but lost its significance when more than 15 LNs were removed . The failure of pN stage to significantly prognosticate DFS in the multivariate analysis in the first group of our study can be attributed to the absence of N3 stage in this group of patients. Another Egyptian study conducted by Elkhodary et al. included 500 patients with node-positive breast cancer. Among them, 93 patients had less than 10 LNs dissected. They used the same LNR cutoff points defined by Vinh-Hung et al. , and found the LNR together with ER negativity and tumor grade, the only factors to influence DFS in the multivariate analysis. The pN stage in their study was only significant in univariate analysis, which as well supports our results . For OS multivariate analysis, our study showed that LNR was an independent adverse prognostic factor (P = 0.03), together with the AJCC stage group, pT stage, pN stage, and extracapsular invasion. Again, this is similar to the results of other published studies, such as those by Elkhodary et al. and Schiffman et al. . In group II, the identified nodal ratio cutoff point of 0.40 in this group of our study lies in the range of the intermediate risk group defined by Vinh-Hung et al. (0.21–0.65); our results are consistent with their results. However, it is higher than the cutoff point of 0.25 identified by Truong et al. . This difference in the value from that reported by Truong et al. is probably because they did not take into consideration the number of dissected nodes, which ranged in their study from 1 to 50 nodes, whereas this group of our study was made of adequately dissected patients (i.e., ≥10 LNs removed). This group of our study showed both LNR and pN stage to be significant adverse prognostic factors in the univariate analysis, but not in the multivariate analysis, highlighting that LNR could be more significant when a lower number of LNs are dissected as suggested by Jayasinghe et al. . However, a large population-based study of 25 315 Dutch patients conducted by Dings et al. showed that both pN stage and LNR are independent adverse prognostic factors for OS, recommending the incorporation of the LNR as an independent factor in the staging of breast cancer. Our study showed no significant survival differences between the two node-negative groups when the cutoff point of 10 dissected LNs was used. This could be attributed to the confounding effect of systemic therapy observed by Weir et al. in their study on 2278 node-negative breast cancer patients, who found that, for patients not receiving systemic therapy, regional relapse was significantly increased with smaller numbers of nodes removed (P = 0.03). There was a trend toward shorter OS with fewer nodes removed (P = 0.06). Node-negative patients who received systemic therapy did not have a higher regional relapse rate or shorter OS when fewer nodes were recovered . RTH also can confound the effect of number of dissected nodes on survival, as shown by the study conducted by Salama et al. , who examined the cutoff point of 10 dissected nodes in 833 node-negative patients who underwent mastectomy and 1094 node-negative patients who underwent breast-conservation surgery followed by RTH. Their results showed that the recovery of less than 10 LNs in LN-negative patients who underwent mastectomy resulted in a 10–15% decreased long-term DFS rate compared with patients who had a more extensive axillary assessment. However, the number of LNs examined did not have an impact on the DFS rate in a contemporary cohort of patients who underwent breast-conservation therapy, which included radiation . However, another study conducted by Moorman et al. used a cutoff point of 20 dissected LNs and showed that the number of LNs examined was not found to be associated with either 5-year or long-term survival. The proportion of women dying from breast carcinoma was the same (8%) in both groups (those patients with ≥20 LNs examined vs. those in whom < 20 LNs were examined) and the hazard ratio was 0.98 (95% confidence interval, 0.58–1.64), suggesting that it is unlikely that the number of LNs examined is an important prognostic indicator in patients with LN-negative breast carcinoma . When we used the cutoff point of six dissected LNs that was identified using ROC curve, there were significant DFS and OS differences between the low-risk and high-risk patients. This is in agreement with the results of Blancas et al. , who conducted a retrospective study on 1606 node-negative invasive breast cancer patients and found that resection of less than six LNs in node-negative patients resulted in lower DFS and breast cancer-specific survival in both univariate and multivariate analysis, suggesting that six or more nodes need to be examined at axillary dissection to be confident of a node-negative status. Our results support the accumulating evidence that LNR could be incorporated into the staging of breast cancer patients, especially those with inadequate axillary dissection. LNR cutoff point of 0.44 can be used to classify node-positive patients with inadequate axillary dissection into low-risk and high-risk groups. LNR cutoff point of 0.40 can be used to classify node-positive patients with adequate axillary dissection into low-risk and high-risk groups. For node-negative patients, oncologists can be satisfied with a number of dissected nodes as low as seven axillary LNs. Siegel R, Naishadham D, Jemal A. Cancer statistics, 2012. CA Cancer J Clin 2012; 62:10–29. Abd Aziz K, Tawfik E, Shaltout EA, Mohamed Abdel Moneum RA. Clinical outcome and survival of breast cancer patients treated at the Clinical Oncology Department, Menoufia University. Menoufia Med J 2015; 28:333–339. Singletary S. Revision of the American Joint Committee on Cancer staging system for breast cancer. J Clin Oncol 2002; 20:3628–3636. Danko M, Bennett K, Zhai J, Marks JR, Olson JA Jr. Improved staging in node-positive breast cancer patients using lymph node ratio: results in 1,788 patients with long-term follow-up. J Am Coll Surg 2010; 210:797–805. Katz A, Smith BL, Golshan M, Niemierko A, Kobayashi W, Raad RA, et al. Nomogram for the prediction of having four or more involved nodes for sentinel lymph node-positive breast cancer. J Clin Oncol 2008; 26:2093–2098. National Comprehensive Cancer Network. Clinical Practice Guidelines in Oncology (NCCN guidelines); 2015. Available at: https://www.nccn.org/professionals/physician_gls/f_guidelines.asp#site. [Last accessed on 2016 Sep 26]. Fisher B, Wolmark N, Bauer M, Redmond C, Gebhardt M. The accuracy of clinical nodal staging and of limited axillary dissection as a determinant of histologic nodal status in carcinoma of the breast. Surg Gynecol Obstet 1981; 152:765–772. Zhou J, Griffith K, Hawley S, Zikmund-Fisher BJ, Janz NK, Sabel MS, et al. Surgeons' knowledge and practices regarding the role of radiation therapy in breast cancer management. Int J Radiat Oncol Biol Phys 2013; 87:1022–1029. Vinh-Hung V, Verschraegen C, Promish DI, Cserni G, Van de Steene J, Tai P, et al. Ratios of involved nodes in early breast cancer. Breast Cancer Res 2004; 6:R680–R688. Van der Wal B, Butzelaar R, Van der Meij S, Boermeester MA. Axillary lymph node ratio and total number of removed lymph nodes: predictors of survival in stage I and II breast cancer. Eur J Surg Oncol 2002; 28:481–489. Voordeckers M, Vinh-Hung V, Van de Steene J, Lamote J, Storme G The lymph node ratio as prognostic factor in node-positive breast cancer. Radiother Oncol 2004; 70:225–230. Vinh-Hung V, Verkooijen H, Fioretta G, Neyroud-Caspar I, Rapiti E, Vlasteos G, et al. Lymph node ratio as an alternative to pN staging in node-positive breast cancer. J Clin Oncol 2009; 27:1062–1068. Wu S, He Z, Li Q, Sun JY, Li FY, Lin Q, et al. 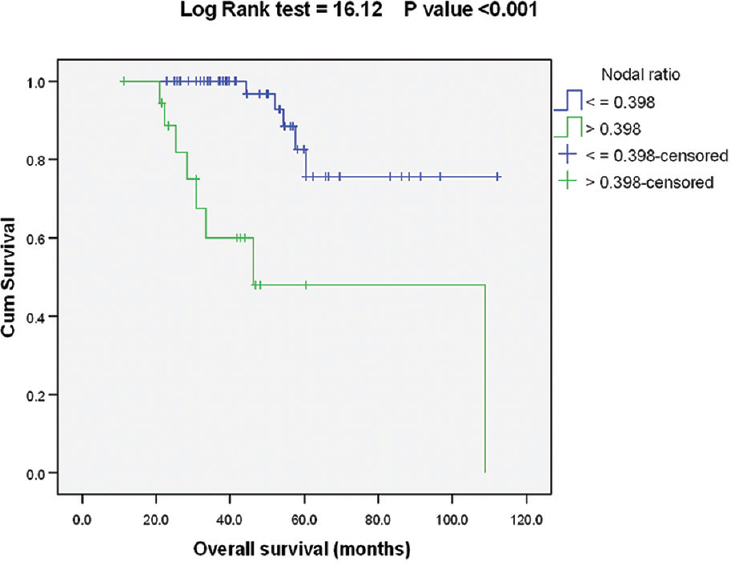 Prognostic value of metastatic axillary lymph node ratio for Chinese breast cancer patients. PLoS One 2013; 8:e61410. Jayasinghe U, Pathmanathan N, Elder E, Boyages J. Prognostic value of the lymph node ratio for lymph-node-positive breast cancer – Is it just a denominator problem?. Springerplus 2015; 4:121. Schaapveld M, de Vries E, van der Graaf W, Otter R, de Vries J, Willemse PH. The prognostic effect of the number of histologically examined axillary lymph nodes in breast cancer: stage migration or age association?. Ann Surg Oncol 2006; 13:465–474. 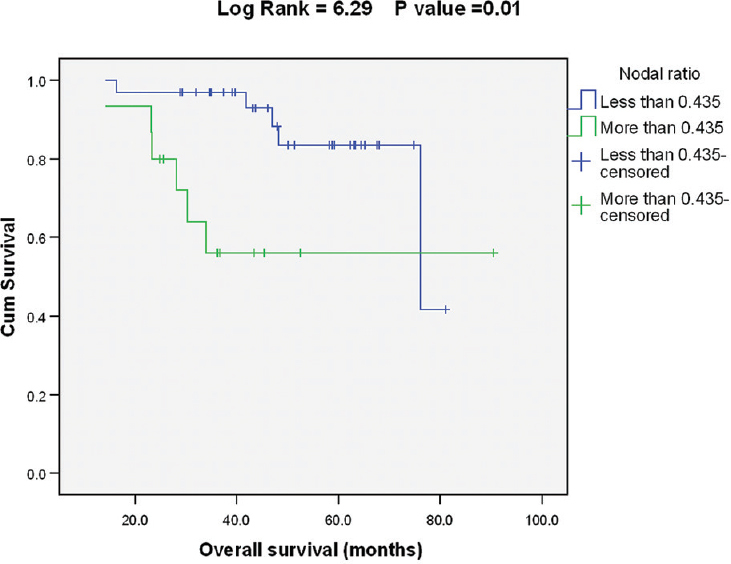 Camp R, Rimm E, Rimm D. A high number of tumor free axillary lymph nodes from patients with lymph node negative breast carcinoma is associated with poor outcome. Cancer 2000; 88:108–113. Salama J, Heimann R, Lin F, Mehta N, Chmura SJ, Singh R, Kao J. 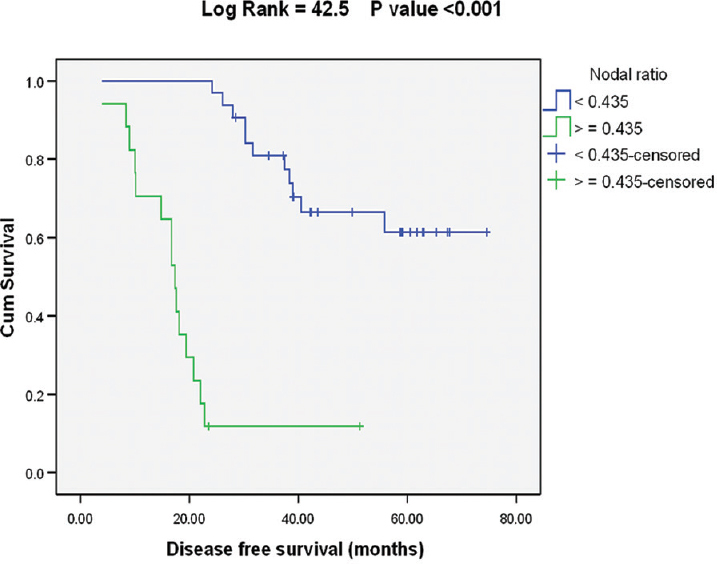 Does the number of lymph nodes examined in patients with lymph node-negative breast carcinoma have prognostic significance?. Cancer 2005; 103:664–671. Matsuguma H, Oki I, Nakahara R, Ohata N, Igarashi S, Mori K, et al. Proposal of new nodal classifications for non-small-cell lung cancer based on the number and ratio of metastatic lymph nodes. Eur J Cardiothorac Surg 2011; 41:19–24. Greenberg R, Itah R, Ghinea R, Sacham-Shmueli E, Inbar R, Avital S. Metastatic lymph node ratio (LNR) as a prognostic variable in colorectal cancer patients undergoing laparoscopic resection. Tech Coloproctol 2011; 15:273–279. Berger AC, Watson JC, Ross EA, Hoffman JP. The metastatic/examined lymph node ratio is an important prognostic factor after pancreaticoduodenectomy for pancreatic adenocarcinoma. Am Surg 2004; 70:235−240; discussion 240. Herr H. Superiority of ratio based lymph node staging for bladder cancer. J Urol 2003; 169:943–945. Truong P, Vinh-Hung V, Cserni G, Woodward WA, Tia P, Vlastos G, Member of the International Nodal Ratio Working Group. The number of positive nodes and the ratio of positive to excised nodes are significant predictors of survival in women with micrometastatic node-positive breast cancer. Eur J Cancer 2008; 44:1670–1677. Schiffman S, McMasters K, Scoggins C, Martin RC, Chaqpar AB. Lymph node ratio: a proposed refinement of current axillary staging in breast cancer patients. J Am Coll Surg 2011; 213:45–52. Dings P, Elferink M, Strobbe L, de Wilt JH. The prognostic value of lymph node ratio in node-positive breast cancer: a Dutch nationwide population-based study. Ann Surg Oncol 2013; 20:2607–2614. Elkhodary T, Ebrahim M, Hatata E, Niazy NA. 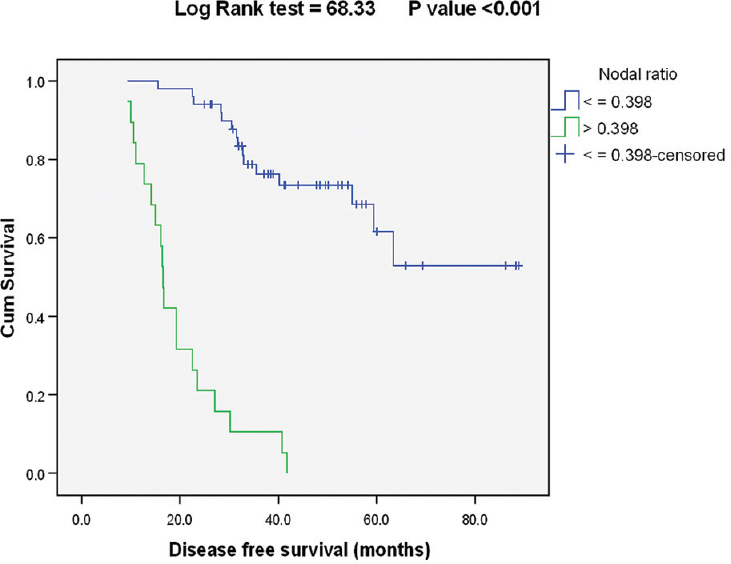 Prognostic value of lymph node ratio in node-positive breast cancer in Egyptian patients. J Egypt Natl Canc Inst 2014; 26:31–35. Weir L, Speers C, Dyachkova Y, Olivotto IA. Prognostic significance of the number of axillary lymph nodes removed in patients with node-negative breast cancer. J Clin Oncol 2002; 20:1793–1799. Moorman P, Hamza A, Marks J, Olson JA. Prognostic significance of the number of lymph nodes examined in patients with lymph node-negative breast carcinoma. Cancer 2001; 91:2258–2262. Blancas I, Garcia-Puche J, Bermejo B, Hanrahan EO, Monteaqudo C, Martínez-Aqulló A, et al. Low number of examined lymph nodes in node-negative breast cancer patients is an adverse prognostic factor. Ann Oncol 2006; 17:1644–1649.